Unearthed by winter storms in Morro Bay, California is what appears to be a 1964 Bonneville station wagon. 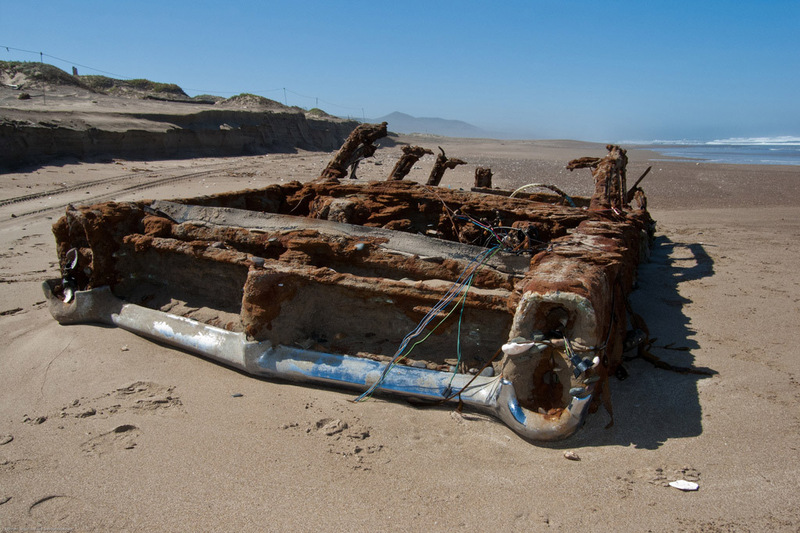 The car was reportedly abandoned in 1973 after stalling on the beach and now after nearly 40 years of decay in a salty graveyard this piece of American iron is a nature crafted sculpture. 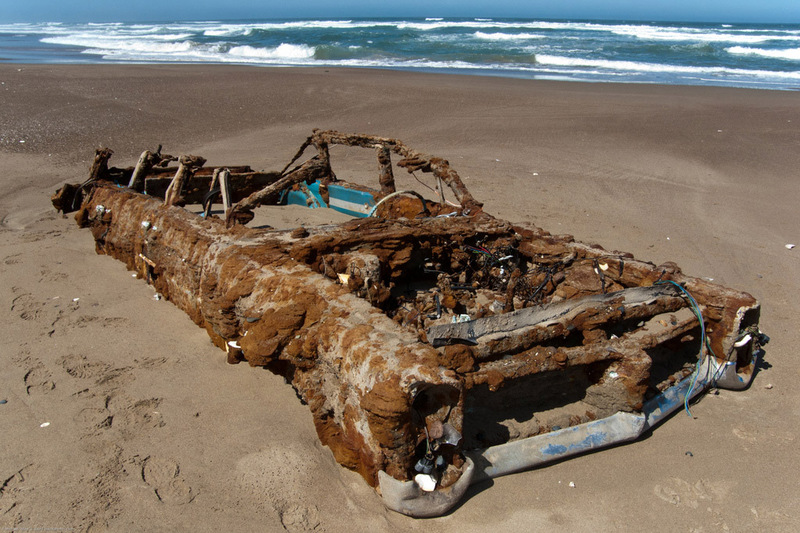 It’s amazing how the backseat and parts of the door panels appear unaffected by the ravages of the elements. 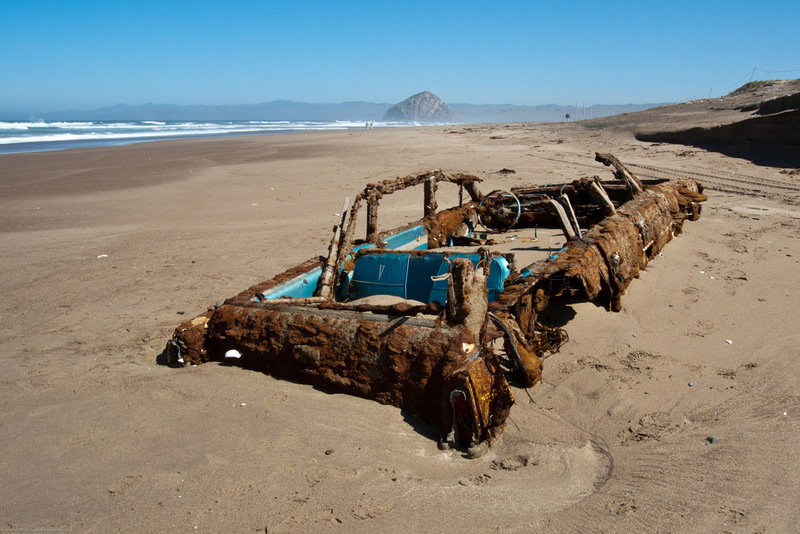 The car was gone a few weeks later- perhaps returned to the sculptor for some finishing touches. We always had station wagons when I was growing up. There were no minivans yet and SUV’s were used for people who actually had to drive over monster boulders and through 3 feet of snow. The station wagons were never glamorous but Dad could haul a ton of stuff in the back and Mom could use it for the weekly trip to Kroger. Station wagons always rattled, leaked and got horrible gas mileage but they did have the ultimate feature for any kid: the wayback seat. 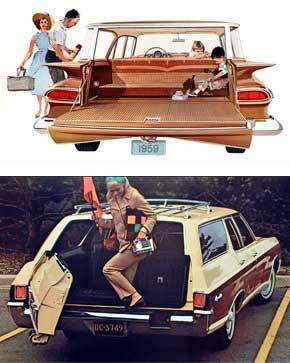 In our family the wayback seat was only used on special occasions: hauling neighborhood kids around and vacations. Sitting in the wayback with a few friends gave us freedom from the strictly enforced rules of second row seating. Drivers who had the unfortunate luck of being behind a seat full of waybackers were subject to a barrage of waves and gross faces. The drivers almost always kept a straight face, but occasionally a driver would react which of course would have us all in stitches. Sitting in the wayback seat on vacations gave kids a perfect vantage point to spot license plates on passing cars for the license plate game. Tents could made out out of blankets and a few pieces of strategically placed luggage. A perfect place to sink into a comic book collection for the long drive.